Secretly Sloshed's captain Mason helped his team to overachieve. A record 707 teams from across the country entered the 8-Ball Open, up from 689 in 2007. Rounds one through 16 and the quarterfinals were played in the table-lined tournament room, located on the main floor of the Riviera. The semifinals and final were played on the top floor of the hotel - the "Top of the Riv" ballroom - with chandeliers, velvet curtains and windows overlooking the Strip. In the second match of the 8-Ball Open final, Westside's Kaessa Watkins - an APA 3 who was seven-and-a-half months pregnant - beat Secretly Sloshed's Denise Crowe, also a 3, by the score of 3-2. Watkins ended the match by banking the 13 ball into the corner pocket, exhaling, then sinking the 8. "I was extremely nervous," said Watkins, a cook who's played pool for eight years. "The opponent I played mattered a lot. Because she didn't come out and handle business like I thought she would, that gave me confidence. I went ahead and did what I had to do." Watkins said her share of the prize money will help pay for her baby. In the first match, Westside's Earl Lane (4) beat Mason (5), 3-2. Mason won the first game, but dropped the next two. After Mason won Game 4, Lane took advantage of two scratches and made a delicate side-pocket shot on the 8 to win the case game. Raymond Procell, Secretly Sloshed's top player, didn't appear in the final. Mason said playing Procell early would've left the team vulnerable. "It doesn't matter if I win one game," said Procell, a union millwright. "Me winning the third or fourth game isn't going to make any difference, because our 2 would have to play their 7. It wouldn't have done anything but dragged the match out, and our 2 would've gotten slaughtered, so why go through all that?" Runnels, Westside's best player, also didn't play in the final. Sitting Procell may have been the right move strategically for Secretly Sloshed, but it was a letdown for fans. Procell (7) put on a show in the semifinal against the team Vested in Pool, discarding Ervin Lawson (6) in five straight games. Apparently, Procell was the only one not impressed with his performance. "I made a few mistakes," he said. "I really don't think about them, though. Pool comes natural to me. It's a God-given talent, so I don't worry too much about it. I just play." "Bubba's probably one of the best, if not the best, 7s in Shreveport and maybe the state," said Mason. "He's a very talented player." In other matches from the semifinal tilt, Secretly Sloshed's April Long (3) beat Vested in Pool's Catherine Miller (3), 2-1; and Gary Allison (6) beat Robert Richardson (5), 5-0. The only win of the semifinal for Vested in Pool, which is from Livonia, Mich., came courtesy of Charlie Ayers (4), who beat Sell, 4-0, in the opener. "I tried to get us started," said Ayers. "That's the main thing. I tried to get us off to a good start, but sometimes you get the breaks and sometimes you don't." In the other semifinal, Westside beat the Untouchables of Springdale, Ohio, 3-1. Again, Mingo won the deciding match, beating Rudolph Boldreghini (3), 2-1. In the case game, the two players each had one ball remaining. Boldreghini cut the 9 into the corner pocket, but missed the 8. Mingo sank the 2 in the corner, then drilled the 8 for the win. Watkins also won a semifinal match. In a 3-to-2 race, she beat APA 4 Chris Strong, making another clutch bank shot. Westside's Frank Johnson (6) beat Alden Miller (5), 5-1. Johnson won the first game, lost the second, then won four in a row. Player-coach Richard Combest (6) earned the Untouchables only win, beating Runnels in a 5-to-4 race. "I came and played the doubles, so I've been here several days," said Combest. "I'm a little drained. In the last 48 hours, I've had about four or five hours of sleep and played eight to 10 matches. It's kind of a relief that it's over. But at the same time, we were so close." Runnels shrugged off the loss. "That's what teammates are for," he said. "I mean, we've got a good team." 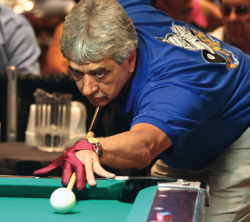 When the 8-Ball Open started on Aug. 18, Runnels wasn't sure he had a good team. He didn't think it would make it to the semifinal or final, telling his players they'd probably be eliminated before the weekend. "They said, 'We're going to make a believer out of you,'" said Runnels. "'We're going to show you we can win this.' They've been showing me ever since." Matt O'Brien is a Las Vegas-based writer and editor and author of the book "Beneath the Neon: Life and Death in the Tunnels of Las Vegas."